Panda Antivirus Pro 2014 is one of the best antivirus in the internet and designed to use in Windows 8. It gives good protection against most of the viruses, malwares, spywares and online hackers with improved cloud technology. Panda Antivirus Pro 2014 is a latest new version released by Panda, with more latest securing techniques. This Antivirus is liked by many of the peoples for easy to use customization. 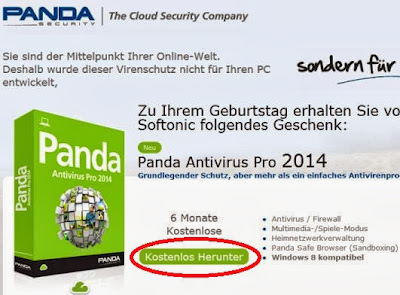 What are the new features in Panda Antivirus Pro 2014? 4. Panda Antivirus provides a safe browser to browse the web safely. 6. Panda SafeCD cleans any malwares if you cannot start the Windows. 7. Supports Virtual Keyboard and etc. How to get Panda Antivirus Pro 2014 for free? Panda team partner shipped with Softonic website and offers the promotion of free Panda Antivirus Pro 2014 for 6 months. You can download the OEM setup installer from the promo page. The OEM installer is a special edition, so no additional code is required to activate the free 6 months subscription.